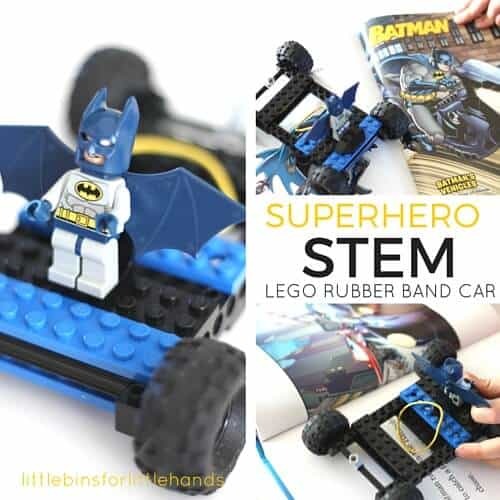 Build Batman’s vehicle with this cool LEGO rubber band car for a book inspired STEM project! This month we were invited to participate in a storybook STEM challenge series. Although, I had initially thought that I needed to choose a book specifically about STEM, I realized any book provides the same kind of opportunity for learning including our beginner Batman book collection. 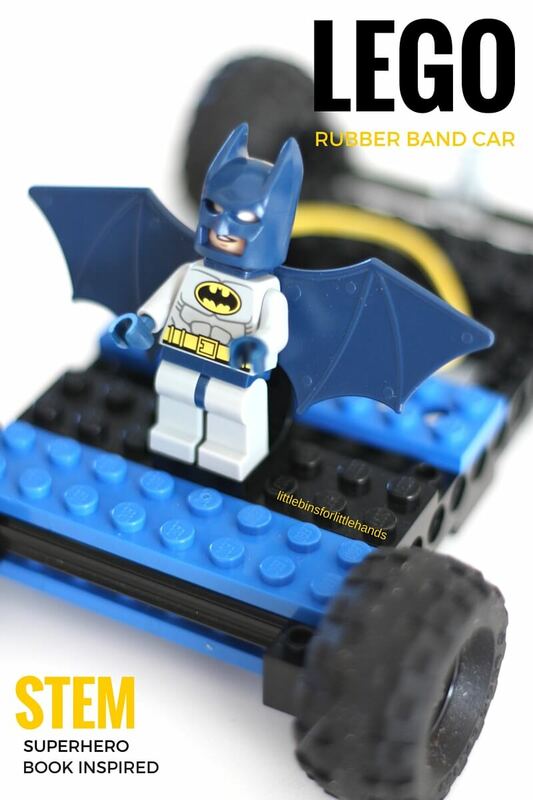 My son wanted to make Batman’s bat mobile out of LEGO, and we have always wanted to try building a LEGO rubber band car! 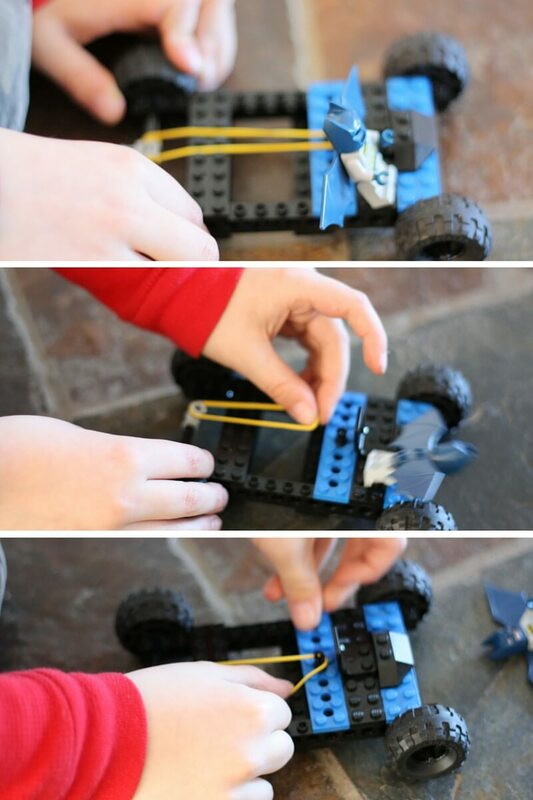 How To Build A LEGO Rubber Band Car! 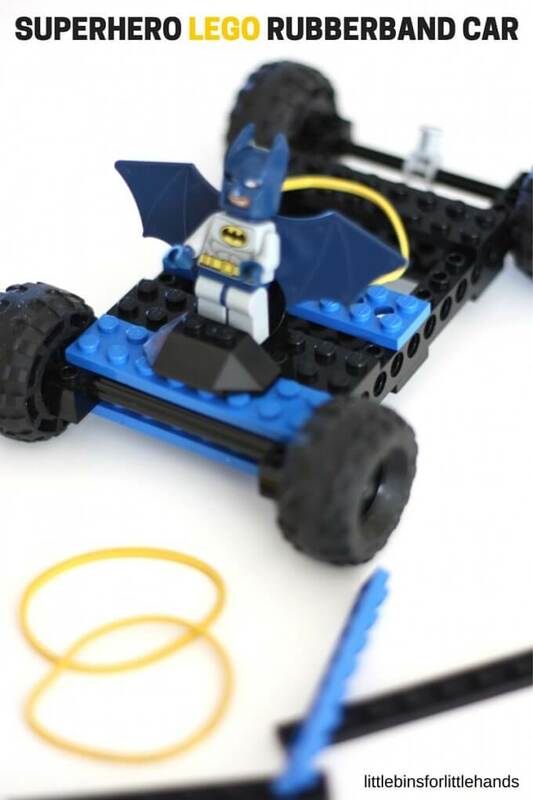 Find out how to turn the Batmobile into a LEGO rubber band car with this fun STEM project. 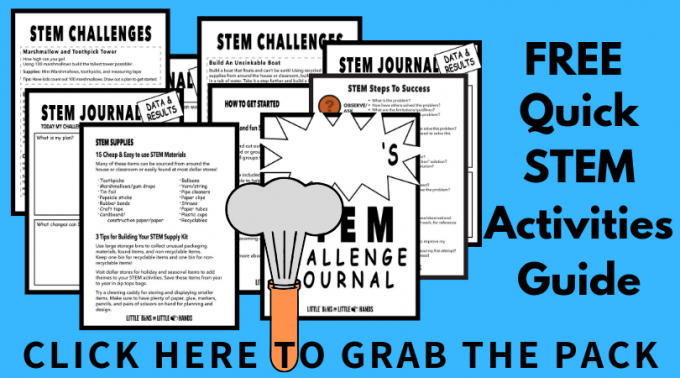 Your favorite book can also be a great STEM activity! 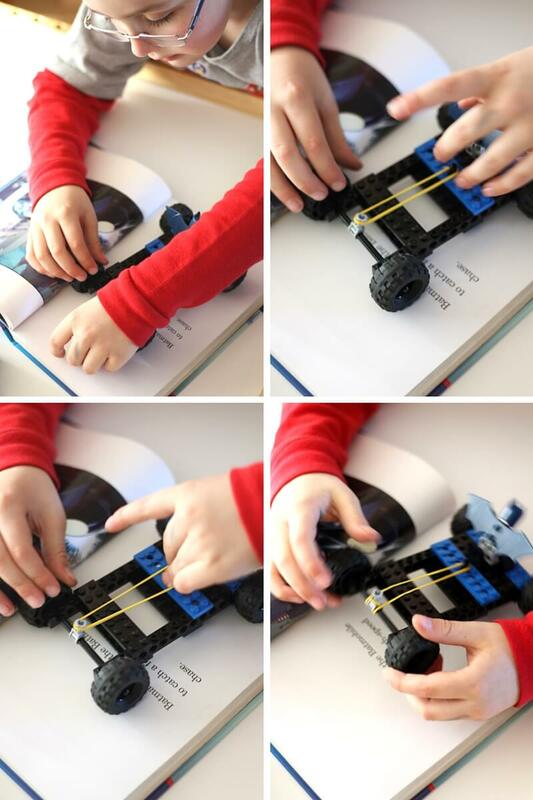 You can build a more complex LEGO rubber band car or a simple one! Either way it moves! 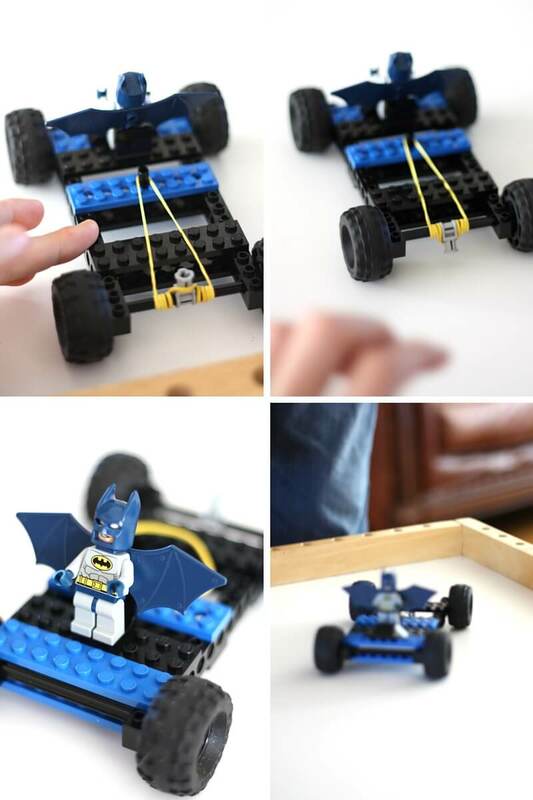 You can see in the two pictures below some of the simple pieces we used to create this LEGO rubber band car and bat mobile. 2 long bricks with holes in them to make the sides of the car. The two important pieces for the rubber band car are the gray piece on the axel show below and the black peg in the blue piece shown below. Use your imagination for the building the rest of the car! You do not have to use the exact pieces below. The key points to remember are having two fixed points. The fixed point on the axel must not spin freely, it must be on their tightly. Otherwise the rubber band can not wind up properly or release properly. 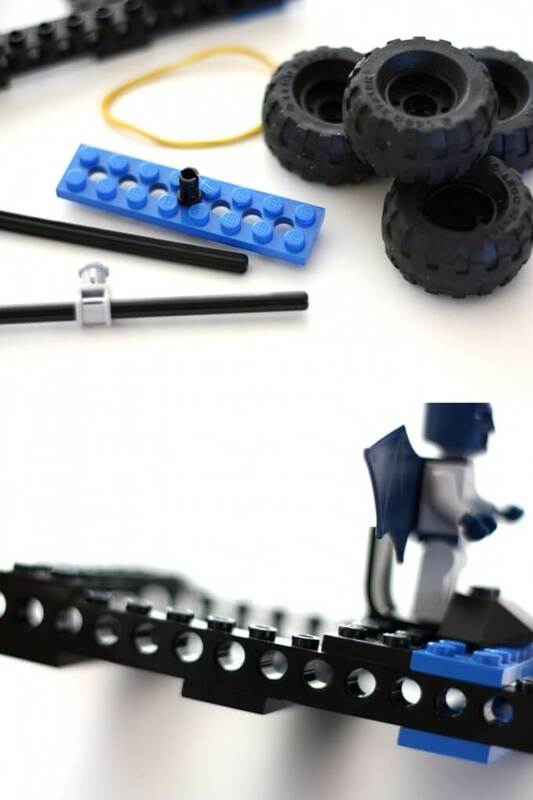 You can turn the black wheel of your LEGO rubber band car to wind it up or you can pull it back on the floor to wind it up! Let it go and see how far it travels. 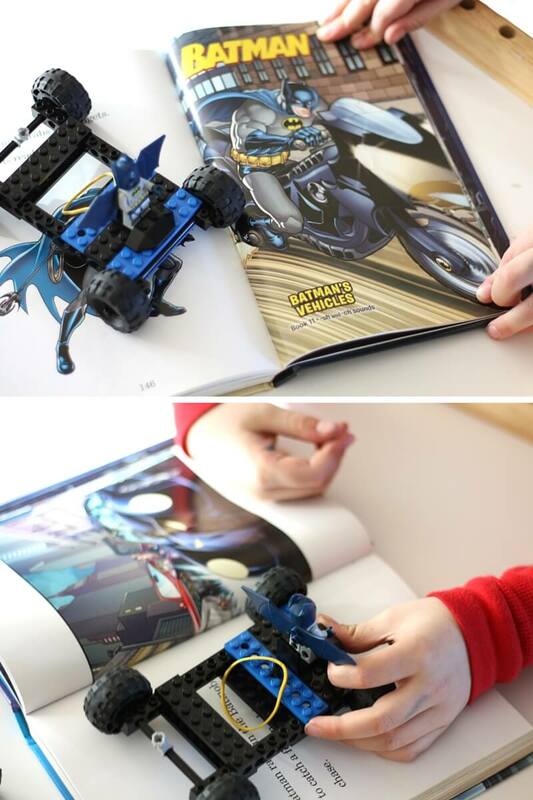 LEGO balloon cars are also a neat project to try! Turn this activity into an experiment by building different size cars or trying out different length rubber bands. Find out which car will go the furthermost. Use a tape measure to record the distances traveled by each! 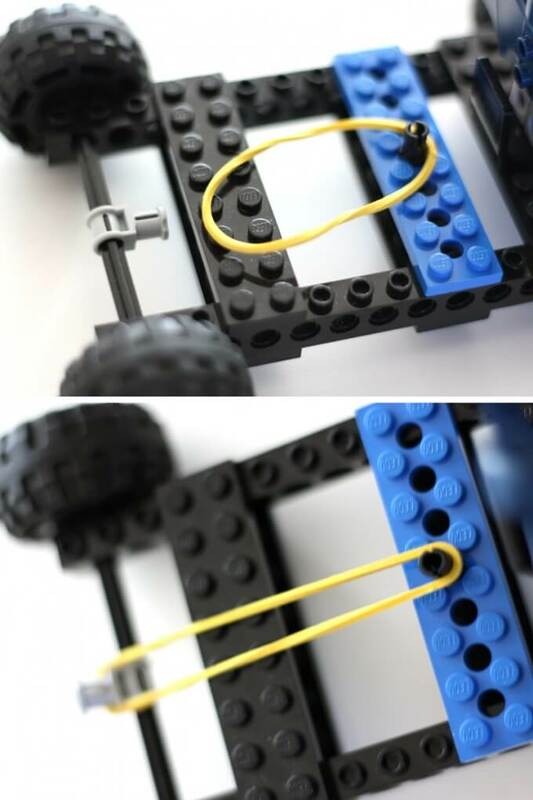 This is a nice simple model for a young child to explore making a LEGO rubber band car. He could easily manipulate it with his fingers. For more fun fine motor and science based practice our icy superhero rescue activity! Next he’s hoping to make a flying LEGO bat thingy. I am sure we can figure something out! We have also used our favorite superheroes to make a computer-free coding game for STEM. Have you ever thought about taking your kid’s favorite book or book character and adding a STEM challenge to it? This is a wonderful way to encourage kid led learning. For us, this was also a fun family activity for an afternoon. Daddy built a pretty cool bat mobile too! 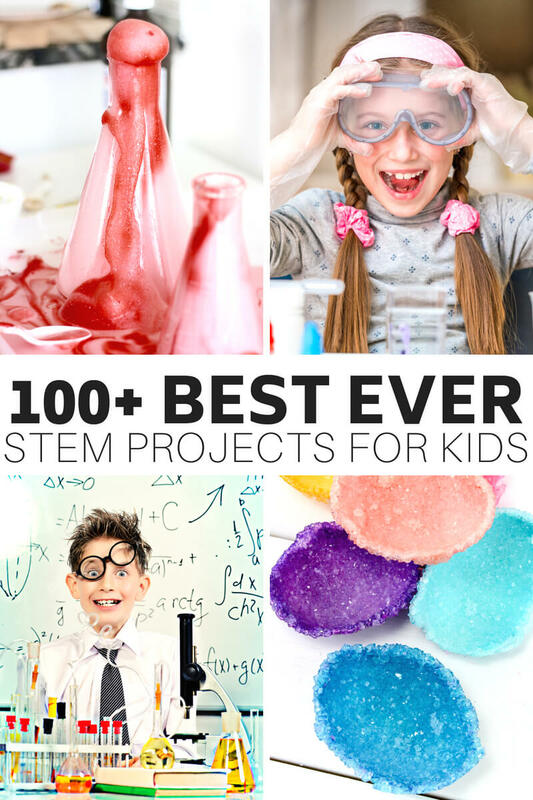 Click on the picture below or on the link for fun STEM projects for kids.